In 1991 Mike Dragutsky was touched by the dream to make great wine and founded Cornerstone Cellars. Dragutsky began the drive to make wines at Cornerstone Cellars that are defined by their elegance and dedication to terroir. Today, Kari Auringer and Charles Thomas, our winemakers, continue to pursue this vision of balanced, elegantly powerful wines. "Excellence is never enough, we have to go beyond and establish an ever higher goal each vintage. Our goal is to craft wines that are not only exceptional, but memorable. Each of our wines expresses the essence of vineyard, variety and vintage, which combine each harvest to create something never to be exactly repeated." We are not about statistics and points, terroir is terroir and every vineyard must find its own balance. There is no finer place in the world to grow cabernet sauvignon, cabernet franc and merlot than the Napa Valley. It is an honor to craft wine from such outstanding vineyards. We make wines we believe in. We make wines we love to drink. Our wines all express our vision of the 3 V's: vineyard, vintage and variety. Seated, standing or lounge areas to enjoy a tasting, glass or bottle at our two unique tasting room locations. 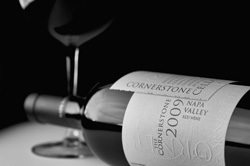 To join the wine club, visit www.cornerstonecellars.com or call 707-945-0388. Nothing is more important to us at Cornerstone than our direct relationship with those that drink our wines. In order to offer our customers guaranteed allocations of our limited production wines and the best possible prices we have created a range of wine club offerings. Each of these clubs is designed to bring our members a unique level of customer service and privileges. For complete information visit our website www.cornerstonecellars.com or call 707-945-0388 extension #2. We offer a 10% discount on current release wines for Napa Valley Residents.